The stove’s been neglected, I’ve chopped barely a handful of onions in the last six weeks, but good food….well my waistline shows the evidence of my gusto for eating, drinking and being merry while in Europe. Leaving the steamy temperatures of a Middle East summer to catch up with my family and friends is something I’ve been lucky enough to do every year as an expat. 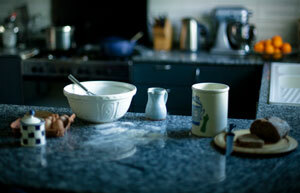 If you join this exodus, how do you cope in other people’s kitchens? Do you sigh with relief at a break from everyday cooking or long to get back to your familiar pots and pans? Would your perfect holiday be self-catering and well-stocked markets or five-star room service? When in Europe I gravitate to the markets and small specialist shops. British food has been through its ups and downs. After rationing during the Second World War, the emphasis was on cheap and plentiful, the sliced white loaf was king and in our enthusiasm to try new things we started to neglect the wonderful produce and recipes our islands were famous for. 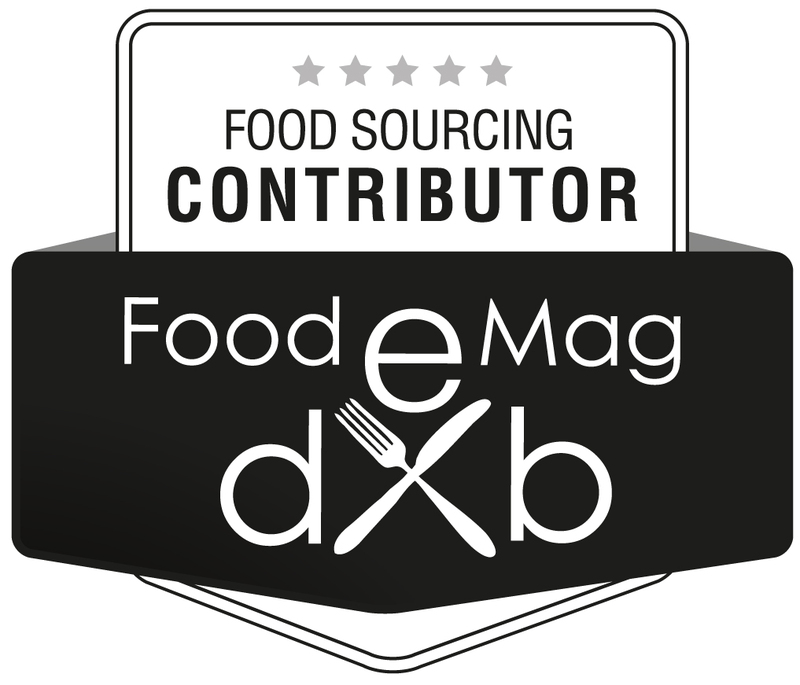 The rise of small producers and an effort to reclaim our own fantastic food culture in the past decade has been really welcome. 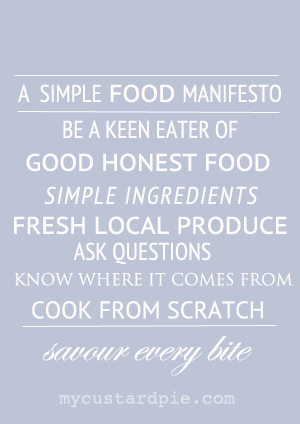 Although the control of the big supermarkets over our food production, and the nation’s appetite for fast food and pizza chains is the dark side of the story, the culinary diversity and quality of some of our food makes me very optimistic. As a visitor in my own home country every summer, there are some edible experiences that I would not miss without fail. Forget prissy table cloths and fancy doilies, for me a cream tea must include: light, fresh, crumbly plain scones (no sultanas), clotted cream (with a crust), excellent strawberry or raspberry jam (preferably home-made), a china pot of tea (I hate those stainless steel things), a jug of milk and a jug of hot water. Bone china tea cups preferred. Tear open the scone (it should part horizontally), spoon on a generous amount of clotted cream then smear on a layer of jam. Reunite the halves and eat – it will never be dainty. The best time to eat a cream tea is when you’ve earned it. 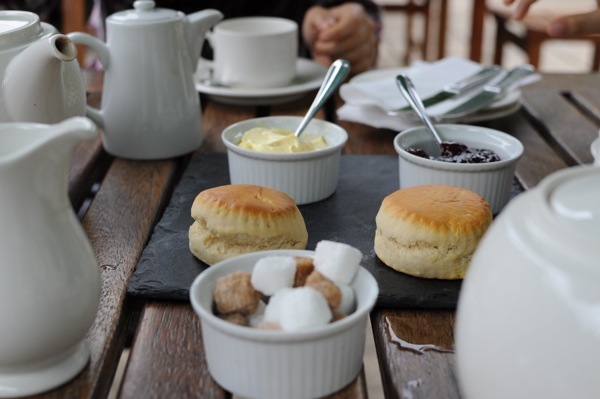 The Swan Hotel in the Cotswold village of Bibury served an excellent cream tea (scones on slate – the ‘in thing’ this summer). There was good service and it was reasonably priced for such a swanky venue (the bar inside is like a Scottish shooting lodge with tartan walls and antlers everywhere). We sat on their front terrace in our scruffy walking clothes after 6 miles of hiking in the beautiful Gloucestershire countryside (read about the hike and see pictures here). For more of my cream tea recommendations see ‘in search of the perfect scone‘. After a few hours of exploring the fields and woods around Blockley on foot, I googled on my Blackberry to find a nice pub nearby. The first result had won the Cotswold Life Food and Drink award for the best pub restaurant so we drove over to the Horse and Groom in Bourton on the Hill. The raised garden at the rear backed onto a field of sheep and had an extensive vegetable patch complete with chicken run. I couldn’t decide which of two local ales to choose so was given a bit of both to try. Home-made elderflower cordial mixed with locally bottled spring water was a delicious non-alcoholic option. The pub has an interesting wine list and local lager and wheat beer. I couldn’t resist trying some organic pork scratchings. KP hates the sounds of crackling being eaten, but he wasn’t here to witness the resounding crunching. The blackboard menu is a short one – always a good sign. 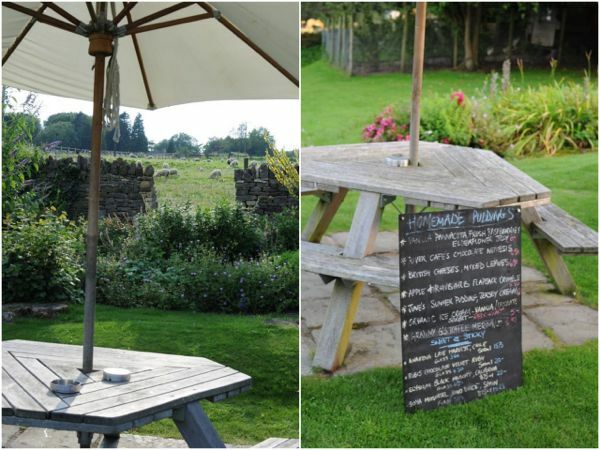 The pub is run by two brothers and one of them explained that most of their ingredients were from the garden and “if we have to compromise we get it up the road” i.e. 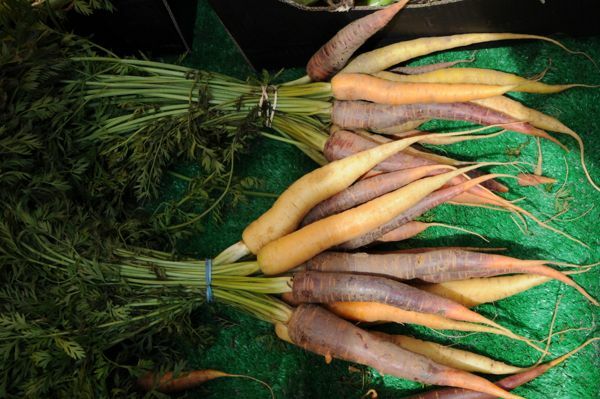 all produce is fresh and local. We ate in the garden as it was a (rare) nice summer’s evening but the inside of the pub is really cosy with mis-matched wooden chairs and tables. My beer-battered hake and chips came with a lovely pea and mint purée plus home-made tartare sauce, my sister’s slow cooked lamb shoulder could be cut with a spoon and she chose creamy dauphinoise potatoes to go with it, my vegetarian daughter had filo parcels filled with spinach, butter beans, feta and pine nuts. We all oohed and aahed over my other daughters magnificent steak, ale and mustard pie. A dish of fresh vegetables were cooked perfectly. 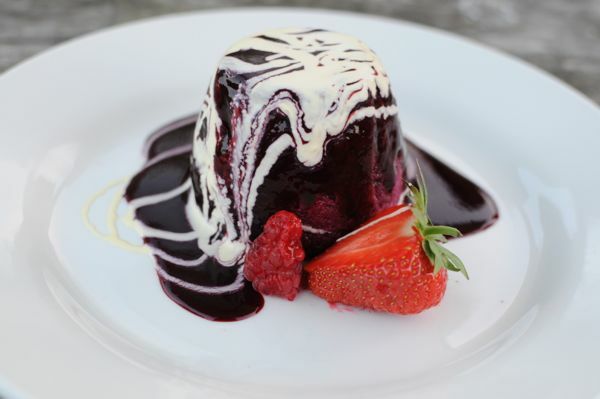 Starters are from £4.75, main courses from £11.50 (which come with fresh vegetables and a choice of potato dishes), puddings from £5 – see latest menu here. 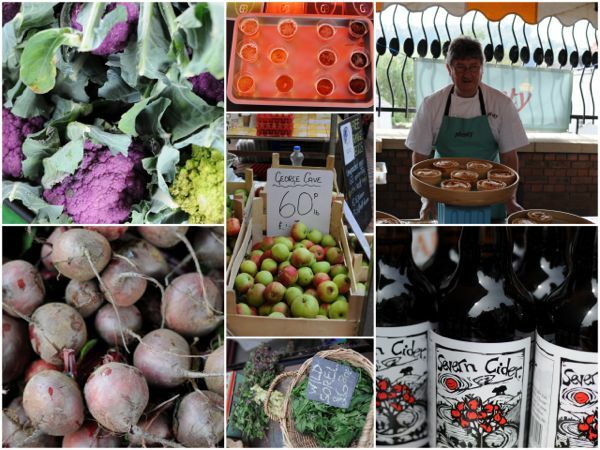 The renaissance of farmers’ markets in the UK is one of the most encouraging developments of the past few years and Stroud is a beacon among them. 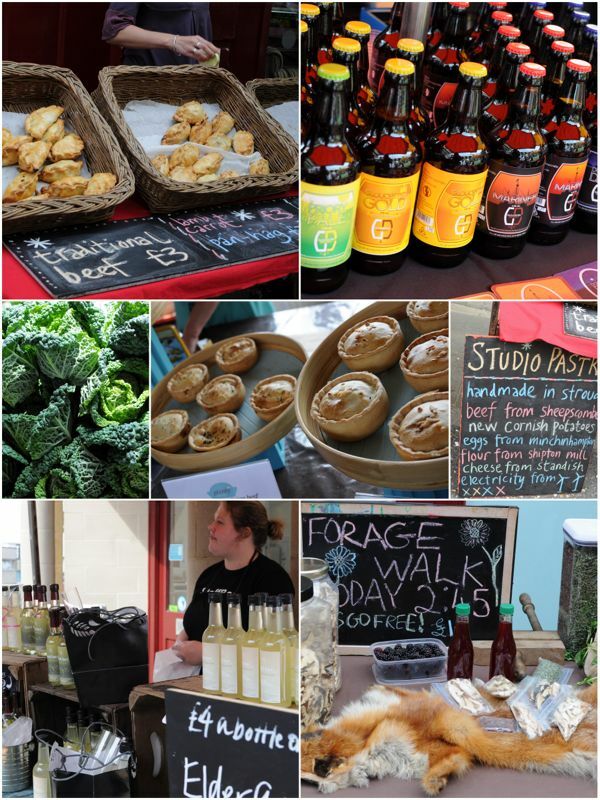 It has been going since 1999 and has grown to over 60 stalls a week including a good range of organic food and drink, local produce, cooked food stalls plus local crafts. It has revitalised the town centre and it’s easy to spend many hours browsing (and tasting) in the market and the surrounding shops – which we did again this summer. My first port of call is always for a Hinton Marsh Farm hot sausage fresh from the grill, in a bun, with mustard. The nice people on the Gloucester Brewery stall gave me a guided tasting of all their ales (which were great with the sausage). My daughter came running over to tell me that she’d tasted the most delicious elderflower champagne – and it was. Jessie’s Ladies (her cows) organic thick and creamy yoghurt and small crunchy, sweet, local apples were also added to our bulging shopping bags. One day I’ll have time to go on a foraging walk, the stall looks so interesting, but the teens were keen to rummage in various vintage shops. I popped one last bottle into my bag. I couldn’t resist some Severn cider. The woodcut label is as attractive as the taste from these traditional hand-crafter ciders made from unsprayed apples of traditional varieties. Their open days at The Old Vicarage, Newnham sound fantastic. The hours fly by at this market and every visit is different (an account of an earlier visit here). 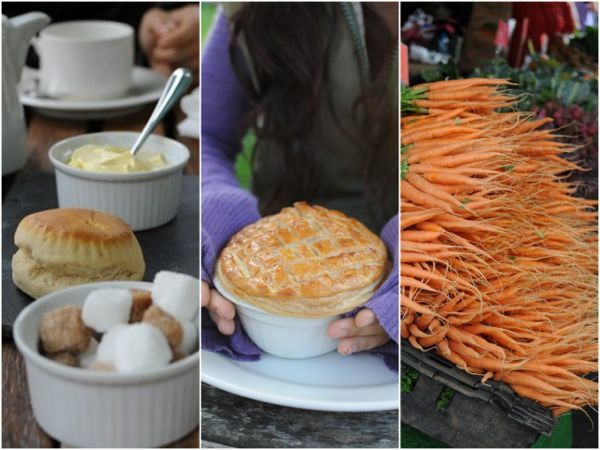 Do you agree with my top three British food experiences? P.S. Whether in your own kitchen or someone else’s, you’ve still got time to bake saffron buns (or experiment with another spice) and join me for the Fresh From the Oven challenge this August. Come and join the summer baking bun-fest. What are the top three where you live now Rosa? Sounds like you had an absolutely fantastic trip. I’ve been eating cream teas pretty much all weekend and agree, they’re hard to beat! Oh, yes, I agree with every recommendation from *my* side of the pond. I’ve prepared many a scone, pots of jam, and my first summer pudding this season. Love British food and am able to buy many grocery imports here. We also have a shop that specializes in pies only a few towns away. Only fixture missing is the sheep. Sigh. Yes I am! No sheep – that’s interesting. They are such a part of the English countryside. I used to use a fantastic programme called Photoscape but have just switched to a Macbook so I’m in search of a good alternative. Google Picassa is what I used this time (collage). Let me know it you need more detailed info. Oh what a perfect top 3! I couldn’t agree with you more about the cream tea – just lovely! When (which is hardly ever) I go away I want to be be spoilt and not have to cook unless I feel like it. I’m sure you deserve the spoiling too. Glad to hear about your Ramadan cooking (we are very guilty of chilli in everything in our family!). Thanks for the comment and best wishes to you all. lovely roundup. Really nice to see farmers markets on the list- something that has only recently become more widely known about and more widespread. And great pictures. Good to see pies and fish and chips on there – truly English meals. The rise of farmers’ markets in the UK is something to celebrate I think. Oh yes – good choice. I don’t think I’ve been to Langford Lechlade – will make a note. What fun. Now I have to make sure that I have these on my next UK holiday bucket list! I am longing to go back to that pub – sadly next year. I’ve heard that you can, but have never tried. The crust on the top is essential. 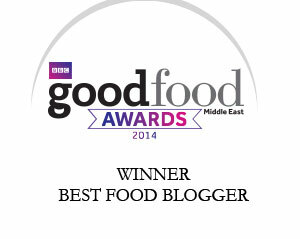 Wonderful write up of good British food Sally. The recent renaissance is such a joy. But you are right, the power of the “big boys” grows ever stronger and I find it hard to be optimistic at times. I am so with you on the cream tea, everything you said except for one small difference – the hot water needed to be in a covered pot rather than a jug or the water goes cold. I don’t find too many purple vegetables back in Dubai either. I steamed the cauliflower to preserve the colour (otherwise it leaches into the cooking water). It was eaten in a trice. Thanks for the nice comment. Oh a tea party after my own heart! I LOVE scones and tea. The best tea is sipped out of bone China, preferably some beautiful English cup and saucer, and enjoyed with homemade scones and homemade jam. Oh my good grief charlie brown 🙂 I’m convinced heaven is an afternoon tea in a rose garden! GREAT photos by the way! Bone china has my vote too. I’ve been sticking my nose into my Mum’s old roses this week. The scent is incredible. Loved the post. so heart warming to read it. Took me back to the time I spent the summers in the UK. Made my day, Sally. I yearn to go back soon. Aaah, I’m sure that will happen Anita – thanks for a lovely comment. This post took me back to Seattle in so many ways. Quaint experiences (though Seattle is more a coffee town than cream tea), pubs with character, farmer’s markets spotted with things that left you with a severe bout of ADD…I sorely miss these things in Dubai. In one of my many moments completely devoid of modesty, I’ll admit that I earned that cream tea weeks ago. Tell me, where can I find the best cream tea in Dubai? Now that is a really good question. I’ve never found genuine clotted cream in Dubai. Maybe cream tea is like fish and chips – it doesn’t travel well. I’ve never been to the UK and you have no idea how much your summer stories make me long to go there. A fortnight ago while I was booking tickets to France I found extremely cheap tickets to London and I was so tempted to buy them but unfortunetely Ivan could not take a longer leave from work and it really isn’t London what I find interesting but the smaller villages, although I’m planning a trip to London for the next year. By the way, my top 3 places to visit wherever I go are the same market, tea/coffee house, pub/restaurant, with a great emphasis on the first two, along with bakeries and cheese shops. Oh yes – cheese shops….I can’t walk past a cheese shop! Thanks Sophie. It’s my home and I love it – although I live far away now. Your top three sound good enough for me! Only one problem after all the gorgeous photos and food descriptions… I am now STARVING. But how I so enjoyed this post! My top is also Afternoon Tea – I can’t resist it!! Just visited Cothele and had another one! fabulous photos! I think I completely agree with your top three (as a fellow UKer) scones are definitely my favourite! 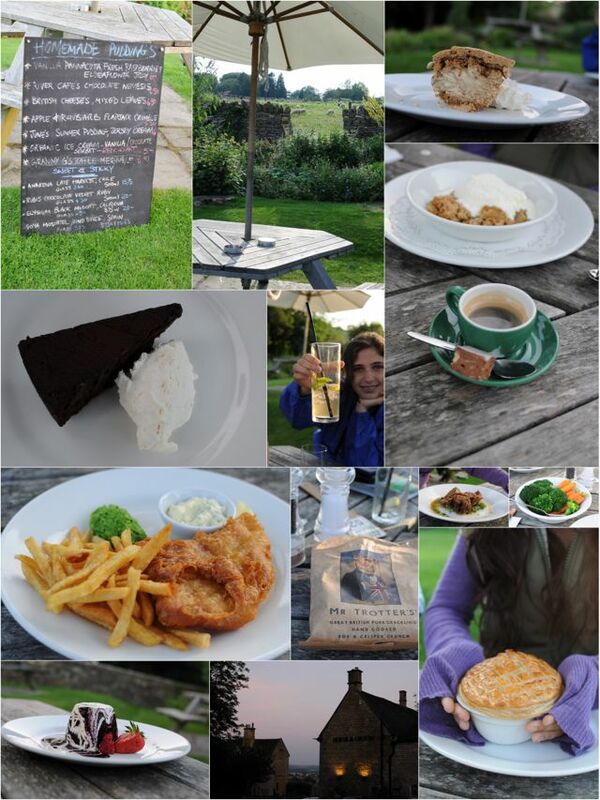 Looks like I really missed out on some fabulous places when we visited the Cotswolds last year. Great post! But what a summer you had – in awe of your Ramadan series Dima. Thanks for the kind words. What a lovely post, Sally! I’ve never been to the UK, but it’s on our list of places to visit so I really enjoyed reading this and going through your beautiful photographs. I’ll definitely keep these “top three” list in mind to make sure it’s what I do whenever I get the chance to visit the UK. What a lovely post! Agree with the 3 experiences, although I would probably add a good curry night too 🙂 Hard to find a pub like you describe unless you get a personal recommendation, so that one sounds like a find. Slightly disturbed by what appears to be a fox pelt on the foraging stall table.. WTF?! ;o) Looks like a wonderful farmers’ market though. Bath does a good one too! Lovely post-as always of course!! Thanks for the heads up for those places-I’ll look out for them next time we are over in The Cotswolds which is just over an hour from here. Stroud is also where Tom of The Fabulous Baker Brothers has his bread shop and does weekend bread making courses with his wood fired oven-highly recommended if you have the time-and can get a much sought after place!! I was looking for a bread course this summer too – next year for sure. Thanks for this.